It's Thursday and I'm thankful for second chances. 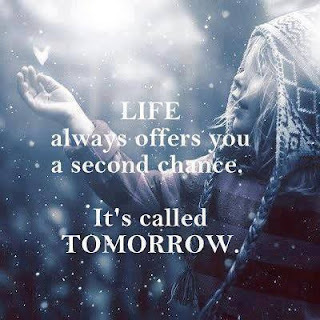 "LIFE always offers you a second chance. 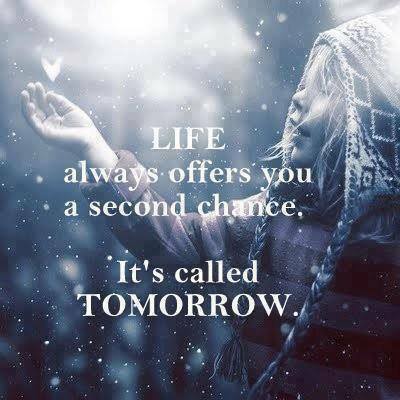 It's called TOMORROW". ~ Author unknown. I found that quote and picture posted above this message online earlier this week and the message captured my heart. It's so true! Here's why: The Bible says that tomorrow is not promised to anyone (Proverbs 27:1). So we are advised by God to not boast about tomorrow, planning what you will and will not do but instead give your thoughts about the future to God and remember that only what He wills to happen in your life will come true (James 4:13-17). The Bible says God's mercies are new every morning (Lamentations 3:22-23), that means every day you have a chance to start anew. So yes, I am thankful for second chances not just to learn from my mistakes in the past or improve in the present and dream positively about my future which I will see, God-willing. But I am thankful for the GOD of second chances because only He wakes me up in the morning and keeps me safe throughout the day and night. Only God is merciful enough to be patient with us when we mess up and give us a new start more than once. Our world does not allow "do-overs" and rarely grants "second chances" but I am glad there is a God who is King over all authorities, a God who knows what we need and often that is a second chance. Did you ever need a second chance? Do you believe God gave it to you? Share your story in the comment section.